Mineral Glow’s micronized mineral powder has rich, golden undertones to add a sun-kissed contour to your complexion. A staple for PÜR aficionados, use it as a quick fix bronzer for an all-year healthy glow. 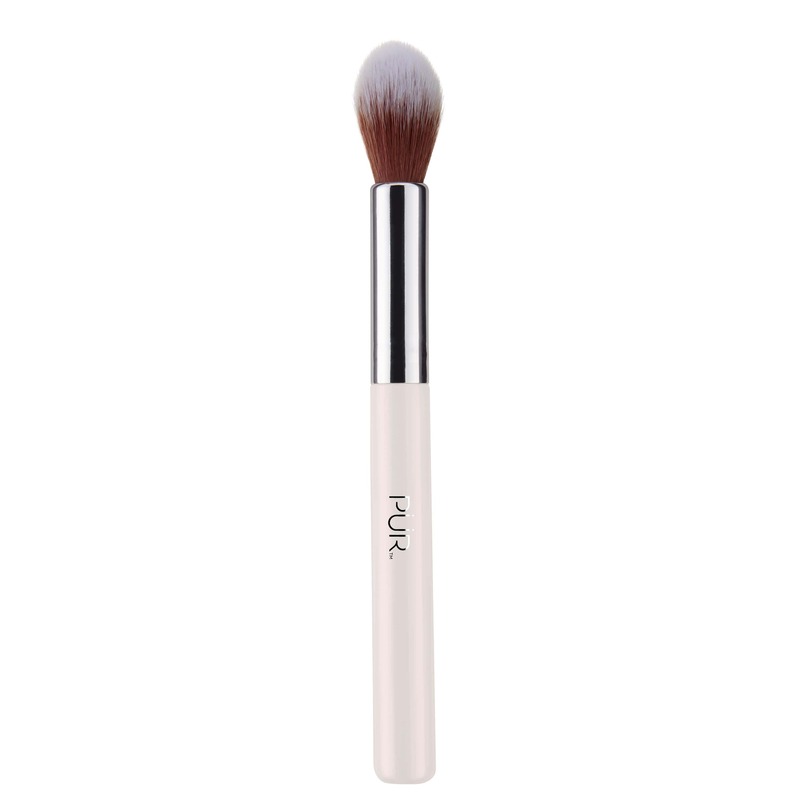 Use the Airbrush Blurring Powder Brush to sweep Mineral Glow over your face, neck or body for a touch of sun. Mineral Glow can be used alone or over any foundation. I was concerned that the product might arrive in broken chunks because I had to have it shipped. Packaging was great. Lots of padding to keep it from bouncing around in the box. A much nicer product than the one I was using before. Goes on well and stays on. Leaves a soft glow to the skin. Would recommend this product to anyone. Just love it. I was looking for a bit of summer color but this was just too dark for me, even when applying it sparingly. I'm blond with fair skin. My daughter in law will love it so off it goes to her! I am very fair...let me just say that most bronzers are a nightmare on my skin, either they are too dark, too muddy, too sparkly, or streak and don't look natural. I LOVE the idea of having the look of a kiss of sun on my face, but I had not been able to find a product that worked for me...until now! I got this in the starter kit and now am a devotee and will never be without it. It is the PERFECT sunkissed look! So natural and like it is actually a part of your skin...like a healthy glow is radiating from the inside. It makes me look happy and healthy. It is subtle, natural-looking, easy to apply and the color, texture and shimmer are just right! Wow, I never thought I'd find the PERFECT bronzer, but I have! Thank you Joli for such a wonderful product. I am a customer for LIFE. Ok...so I got this with the 4 in 1 foundation. My skin looks great with the foundation alone, but when I dust on mineral glow. WOW! It just gives my skin a healthy glow. Cant live without this stuff! This adds just what you need for a sunkiss look in the summer or for a night out it makes your face glow (I guess that's where the name comes from). Again, like most Pur Mineral products, you put just what you need if it's just a little glow or more for a night make-up. Easy and great looking! This product just makes my face look so radiant! I have an olive skin tone while my friend has lighter skin tones. This product looks fantastic on both of us! We're sold! I have received this in various kits. I still have a couple in the old packaging as well as a few in the new. The new packaging is not as thick as the old one (although it looks better). I have found that both packaging designs of this product have been flawed. I dropped this bronzer once and it shattered into a million pieces. It has ended up on my bathroom floor, all over clothes, and all over sheets. Also, doesn't last that long and can look too orange and muddy if applied more heavily handed. Additionally, contains too much glitter. Prefer a matte bronzer in a lighter shade for fairer skin tones. Give a Pretty Glow To The Skin! This product is so much better than alot of mineral bronzers that I have ever used. It just gives my face a healthy glow to it. And, that is what I desire and certainly not a fake orangey or muddy look. Have you been on vacation? Wearing this on the day after working all night is an instant pick-me-up because people think I look greatly refreshed, like I've just come back from vacation. It will go well with any complexion on top of any foundation. It's a miracle in a compact. Love this the way this product lasts all day. Oh how I love thee!!!!!! I'm pale /olive complexion, and have been using this as a foundation, powder, and what have you. My skin looks amazing! It brightens up my face and doesn't look the slightest bit too dark or muddy, I pop on some smashbox primer, this gem, and a bit of concealor. Good to go!!! Yay! This bronzer goes on pretty well. It isn't too shimmery and definitely compliments my light skin. I have tried a number of bronzers and this is by far the best bronzer I have used. It lasts a long time because you only need to use a little. It makes my skin glow. I even bring it down to my chest. I received this product in the starter kit and was a bit worried at first when I did a swatch on my finger. It looked very light and I thought it wouldn't do much, but I was wrong! This is the perfect product to give you a natural glow. My skin is very light, so I like to add a pop of natural color to it. I put some on my cheeks, chin, nose, and forehead and it looks great. This is not a heavy product that will make you look like you have a fake tan or brown blush caked on your face. Perfect consistency and perfect level of sheerness. Definitely recommend! I'm very fair (I think I have the same skin as "BarelyThere" (LOL)) and when I saw this I thought "No way", but I tried it and it's really nice! It looks better on me in the daytime during the summer (when I'm at my palest it looks a little too shimery for the workday), but it always looks fabulous in the evening. It's not a "bronzer" as you know it. It's more of a suble, sheer bronzey shimmer that's very flattering. And this comes from someone who normally thinks bonzers look cheap and tacky, so it's a big compliment! Easy to use. A great natural looking bronzer even on my medium skin tone. I love to wear alone or on top of my foundation? Mineral Glow adds a natural looking touch of sun that shows your skin off at its healthy best! 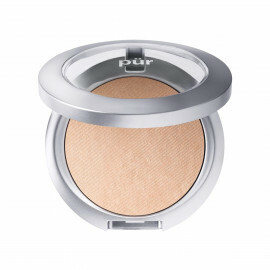 As with the other Pur Mineral powders, I can attest that this one is great for dry skin! This product (as well as the Universal Marble Mineral Powder & Bronzer) is also perfect for contouring a double chin or creating cheekbones via natural shading that highlights one's face! This is an amazing product! I have just a little on and everyone always compliments me. I have found that it gives you that beautiful glow - looks like when you're pregnant / breastfeeding glow. Best purchase ever. And in any light it looks amazing. And people compliment about how beautiful your skin is. So incredible. This is a great mineral glow and it works really good on my skin. My face glows and looks so cool when I put it on. It really brings out all of my facial features. Nice product that lasts. I use mine all year long. I use a light sweep in the winter months and a generous one in the summer. I also love to take this on winter holidays to hot places, so I don't look so pale upon arrival! Best powder brozer out there! I love this bronzer! I used to shy away from them after trying the one from the popular line. It left me looking orange, not tan. I tried another loose brozer from an independent company, but it give more sparkle than anything. This is the only bronzer I will use! You don't need a lot. I have the little one from the starter kit and it has lasted me months. You can use this product alone, you can layer after your 4 in 1 or you can use after liquid foundation. Adds just the right amount of "color" and shimmer on its own then finish off with a touch of blush to accentuate the cheeks. love this product, please dont even change the formulation! When using this product this summer to give my face a bright tanned look I received numerous compliment from co-workers and customers. Everyone asked if I had been away at a sunny destination. I gush to my female friends abut PurMinerals and the great advantages it has. Not only about the MineralGlow but about all the products and about how they do not irritate my already sensitive skin! Thanks PurMinerals for helping me look great!!! This is by far the best product I have tried! I don't know how I lived so long without using it! It gives just the right amount of healthy glow everytime. I get complimented on how beautiful my skin looks all the time. Definitely recommend it!! I love this and use it daily! it's a beautiful bronzer that doesn't look orange or dry and cakey. I use this for a summer glow year 'round, to provide contouring and also to bridge the gap should my skin be between two foundation colors. Oh, and there's actually delicious skin care benefits as it contains that Pur Minerals exclusive Ceratin Complex. Great job, Pur Minerals! Love it! This really gives you a glow and a splash of color without being over powering and streaky like some bronzers. it looks like i got kissed by the sun and not like ive been sitting in a tanning bed for hours. Thanks pur minerals this is so beautiful. I love this product. I use it as a bronzer and it immediately brightens up my face. I also like that it is not too overwhelming when I put it on. Overall, the perfect face brightener for any time of year. I'm not usually a bronzer kind of girl, but this one inspires me to use it. And like so many other purminerals products, I love the blendability & buildable coverage. This product is very easy to use because it doesn't look fake at all, not dark like so many others - just gives you a nice sun-kissed look. Great for a little winter pick-me-up or when you want to look really healthy, especially if you're fair skinned like me!!!! Will change your entire look! I love this product. I have used it every single time I have applied make-up since the day Pur sent it to me as a bonus gift. My look is incomplete without it. I use it to contour, on my cheekbones. This is the best product I have ever used on my face. It evens out my skin tone and gives it a healthy tanned glow without the sun. I absolutely love it. I wasn't too sure because of the prices, but I'm sold! I didn't know my makeup could look this good! Mineral glow gives my skin a natural look. It blends well and the shimmer is not overwhelming at all. I would recommend mineral glow to anyone. I also like the fact that its a pressed powder and not loose....its not messy at all. If you want a nice sun-kissed look or a little winter pick-me-up, this is the "purfect" product for you. If you want dark, fake-looking or shimmery bronzer then this isn't it. I love the blendability & buildable coverage & it's very easy to use because it doesn't look fake at all. Great when you want to look really healthy, especially if you're fair skinned like me. Another Terrific Product from Joli! This is, by far, the most natural-looking "bronzer" I have EVER used. You won't look orange or like you have some dried up mud on your face, and you won't see sparkles all over your face...just simple perfection. I absolutely love this product and have been using it every single day throughout the summer. Pur offers the best products, and I am so very thankful to have found them. I love this product, I have been using it for a few years now. It gives me that instant "tan" appearance, without sunning. I get a lot of comments that I have a "glow" when I use it. Also, I have sensitive skin and have never reacted to any PUR products. I love mineral glow! It is great in the summer to give you the sun-kissed look or in the winter to get rid of my dull complexion. I have been using it for a whole year now. I wear it on top of the pressed mineral foundation and they pair beautifully. I highly recommend it! This is as it says, its really nice, it helps you to achieve that natural glow and tone to your skin without having to be in the sun, it doesn't take the moisture out of your skin, which is a problem I usually had with my past base products, this is a definite have to have for your makeup kit. Perfect bronzer--not too dark or light, not too glittery on my over-50 skin. Reasonable price too. Recently tried this pur mineral product while visiting a friend. She is hooked and now so am I. WOW ! Nicest powder ever. Made my skin soft, smooth and the best thing of all, it hid my rosacea. I think I looked years younger. Gotta order some now ! Received one of these in my boxy charm and I'm in love. It gives the perfect bronze glow without looking orange. With every new Pur product I try I love the brand more and more. I have tanned Asian skin. This is a great peachy/tan look. It's true- I'm addicted. We live in Copenhagen where there is six months of darkness and this stuff has saved me from looking like I've been living in a cave all my life! I really do love it and even though I've been using it daily, this little trial size lasted me 9months. Of course, someone will probably say you shouldn't use it that long, but it worked out okay for me!